My first 2018 review for DanceTabs is up - San Francisco Movement Arts Festival's Stations of the Movement at Grace Cathedral in San Francisco! Today, ballet is such a prevalent force in the American performing arts scene. So much so that it’s easy to forget that American ballet is actually a recent phenomenon, at least relatively speaking. Compared to ballet’s long history in other cultures, American ballet is still in its infancy, or perhaps adolescence is more accurate - not really woven into the cultural fabric until the early part of the twentieth century. An abundance of dance scholarship has been proffered about those ‘beginning’ years, much of it, of course, centering on George Balanchine. Andrea Harris’ Making Ballet American – Modernism Before and Beyond Balanchine, a new release from Oxford University Press and part of the Oxford Studies in Dance Theory, shares a more detailed and highly nuanced perspective on this topic. Yes it covers the early-mid 1900s, yes it is about Balanchine, and yes, it is about the artists/endeavors/efforts that influenced American ballet. But the book is more than that. Making Ballet American extends both pre- and post- the early-mid 1990s to provide a fuller picture. It has a broad cast of characters, and takes a deep dive into the impactful contributions of Lincoln Kirstein and Edwin Denby along with Eugene Loring, Agnes de Mille and John Martin. It seeks to mine terms like ‘modernism’ and ‘neoclassicism’ by placing them within a wider swath, one that is simultaneously political, historical, interdisciplinary, cultural, geographic, sociological and economic. 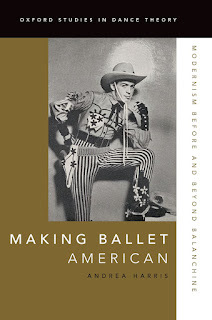 It has a compelling format that Harris calls “chapters and interchapters”, where her inquiry, concepts and commentary are further investigated through tangible case studies of three ballets: Billy the Kid, Rodeo and Western Symphony. And Harris’ prose should be a model for others – hers is writing that is clearly academic in tone but at the same time, accessible to a larger audience. The case studies, in particular, I found to be full of hidden gems. How traveling directions in Loring’s Billy the Kid (1938) were more narratively-driven than structural or how the gestural choreography in the ballet was intended as a literal reflection of certain tasks and motions. Or Harris’ discussion of de Mille’s Rodeo (1942) and how in its earlier iterations, it was more of a conceptual work that had a deep sense of place. And I loved the detailed notation breakdown of Western Symphony’s (choreographed by Balanchine in 1954) four movements. My only thought – considering the book’s year of publication, perhaps a different title, or different wording? 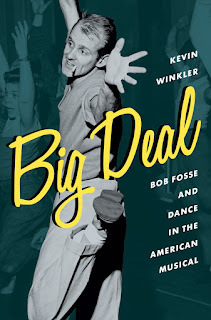 Another wonderfully accessible and cleverly conceived read is Kevin Winkler’s upcoming Big Deal – Bob Fosse and Dance in the American Musical, new this Spring from Oxford University Press as part of their Broadway Legacies Series. Big Deal is a terrific blend of narrative and meticulous research, but doesn’t read like a traditional biography. Winkler is able to combine his consummate skills as a storyteller with his direct personal connection to the material. The result is a thoroughly entertaining sojourn into the life and work of an industry legend, one whose choreography has been on small stages and in vast theaters; on television and on the big screen. And one whose ‘jazz hands’ are now a colloquial term. Winkler spends the beginning chapters of Big Deal sharing the early days of Fosse’s career: first forays into performance, individuals he met and worked with during this time and his exposure to an array of choreographic genres, which in turn, would shape his own evolving choreographic style. Some influences were expected, like Burlesque, Vaudeville and tap, while others were a fantastic surprise, like Indian and Balinese traditional dance and early modern forms. After reading Big Deal, I immediately checked out the 1972 movie version of Cabaret, mining the choreography for Kathak eye movements, Limón upper-body curves and the elongated lines of old school percussive dance. Another thread Winkler weaves through Big Deal is Fosse’s relationship with women - personally, professionally and of course, the oft circumstance when it was both. Winkler relays Fosse’s several marriages and long-term partnerships as well as the relationships he pursued and maintained outside of his marriages. He talks about their deep creative connections, in rehearsal, in performance and in the choreographic process itself. But when speaking about Mary Ann Niles, Joan McCracken, Gwen Verdon, Ann Reinking (and others), Winkler reveals something more nuanced. At every point in Fosse’s career, women were instrumental in its forward propulsion - providing opportunities, campaigning for him to be involved in projects, quite literally and quite often, making the next ‘thing’ happen. Without these powerhouse women, it seems that the story would have been very different. Big Deal covers much ground in its eleven chapters and brief epilogue: Fosse’s peers and his relationship to them, his penchant for the ‘show within a show’ format and lengthy ballets within his various productions as well as his commitment to deepening the dialogue about how dance alone can continue a theatrical narrative. Winkler gives equal attention to Fosse’s more famous shows and to his less familiar works, and provides a very astute glimpse into the complex and fraught system of choreographic and artistic copyright during the mid-late 1900s.